A peaceful and serene morning unfolds over Chickadee Pond located in the Wild Basin section of Rocky Mountain National Park. 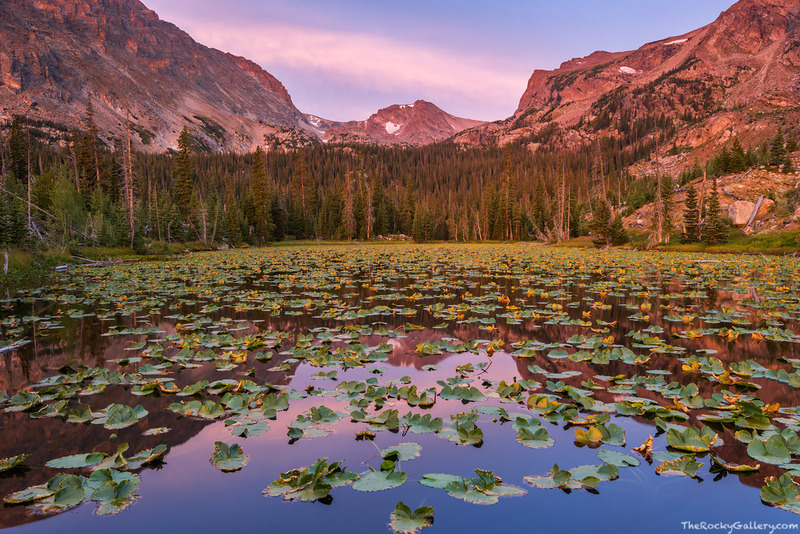 This small unassuming body of water located between Ouzel lake and Bluebird Lake is beautifully adorned during the summer months with pond lilies. Wild Basin is one of my favorite locations for landscape photography in all of Rocky Mountain National Park. It's remote, it requires long hikes to reach many of the lakes and the views and peaks such as Ouzel Peak in the background are amazing. Many of the mountains and lakes in Wild Basin are named after birds. For example Chickadee Pond sits right above Ouzel Lake along the Bluebird Lake trail while Ouzel Peak can be seen in the distance. A Chickadee,Ouzel(American Dipper) and Bluebird are all birds that frequent this area. W.S. Cooper a botanist who visited Wild Basin in the early nineteen hundreds is responsible for naming many of the features found in Wild Basin. Photo © copyright by Thomas Mangan.